Strange behaviour at Carleton University last week has been linked to a new virus, called Overwijkitis, being researched in university labs. University officials are strongly advising that students remain in their homes and away from anyone who may be infected. Those who have been infected can be distinguished from others by a distinct red mark on their hands. Anyone with these red marks is infected. Zombies infect one other person per day in order to stay alive. It is expected that the virus will spread next to neighboring towns and cities. Zombies Present in Local High Schools: Due to the high number of Carleton University students who live in the Glebe neighbourhood, Glebe students have been quarantined in their classrooms to decrease the chance of Overwijkitis spreading to the rest of Glebe. 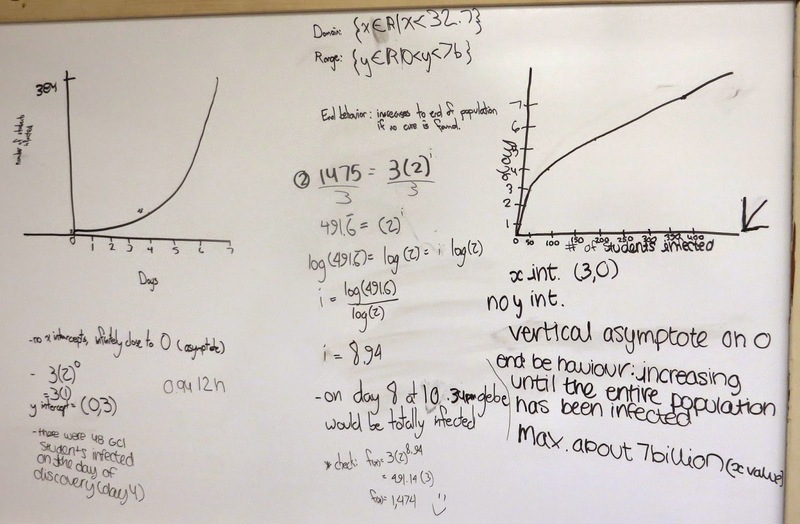 Students in math classes may be at a higher risk, since the virus has been extremely active amongst math teachers at Carleton U. Classes that should be extremely cautious are Ms. Bernstein's, Mr. Overwijk's (in particular), Mr. Phillip’s as well as Mr. Needham's classes. Initially there were 3 students with the Overwijkitis virus. The virus was first discovered at Glebe only on day 4 of the infection. 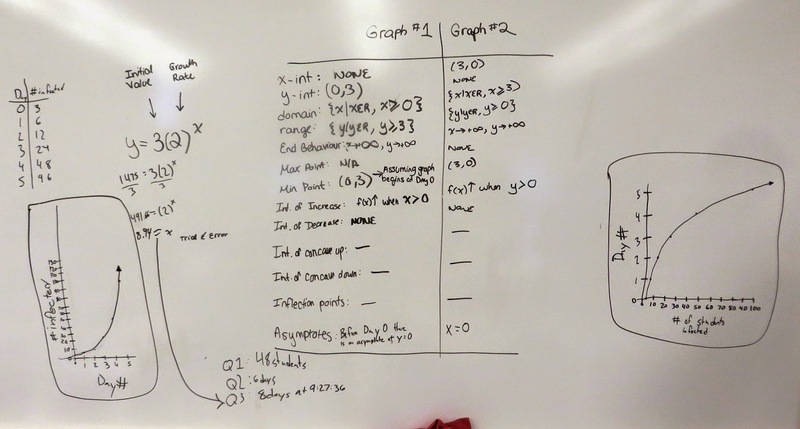 Create a graph, table and equation to model the situation. Assume the day of infection is DAY 0. What patterns did you see when filling in the tables and writing equations? 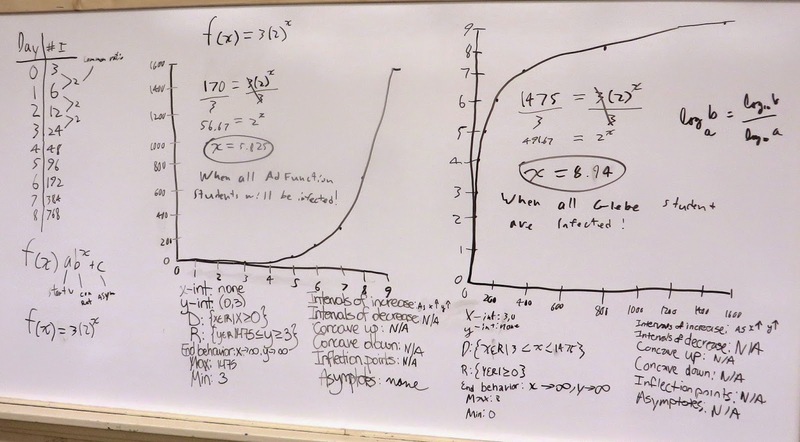 Do Zombie Attacks appear to be linear or exponential? Why? How many students were infected with the virus when it was first discovered at Glebe? If there are 170 Advanced Functions students, how many days until they are all infected? 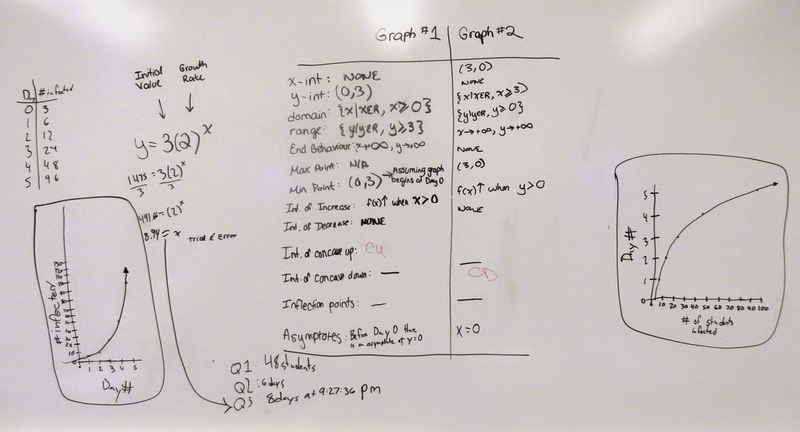 Figure out when all of GCI (1475 students) is infected. 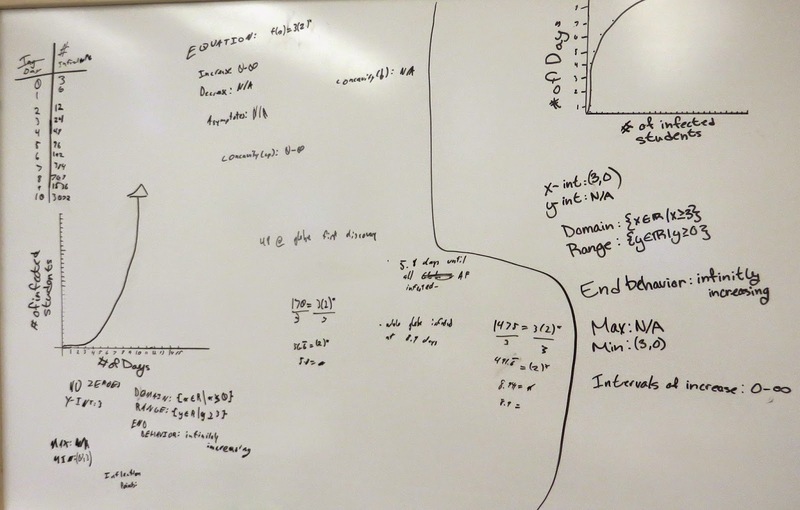 One Overwijkitis infected student had the idea of switching the axes of the graph drawn. Draw the new graph.